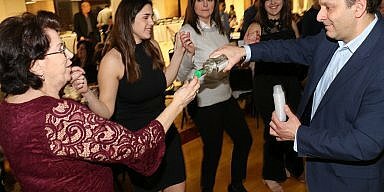 Elkins Park, PA – “It’s about community, and we love to celebrate with the Greeks”, said one attendee at this years OPA! Greek Festival. 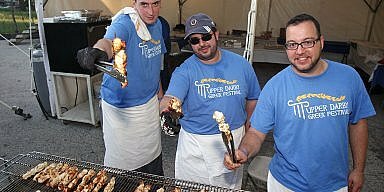 Souvlakia in the pit, platters under the tent and a dance troupe performing the traditions that make this summertime event a staple for all neighbors in the area. Annunciation Greek Orthodox Church plays host to this annual event year after year. They park their cars blocks away and stroll through the beautiful streets till they arrive on the grounds where they’re welcomed with “Philoxenia”. Parishioners with big smiles at every stand greet you with kefi. Ask any of them what’s great to eat, they all have their favorites. But above all, it’s about supporting your community and seeing your friends they’ll all agree on. A wonderful aspect of this jolly festival is also the church tour. Contrasting what’s going on outside, Father John of Annunciation awaits small tour groups that stand by, waiting their turn to enter the church, where Father John eagerly awaits them, to share the story of Orthodoxy and the community. The Byzantine iconography and arches inside the church make the tour a delightful way to enjoy the key point of this community. 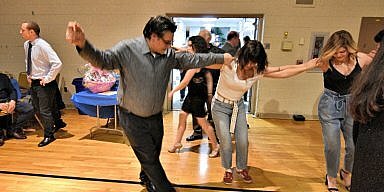 Outside, games, rides, food and traditions of Hellenism all served up by a community that is one of the oldest parishes in North America, keep the faith and all things Greek alive. The annual event continues to be hosted on Memorial day weekend and kicks off the summer for the Elkins Park community.